I’ve been doing quite a bit of speaking this season, to church groups and moms groups and groups of parents. As I’ve prepared the talks for each gathering, I’ve realized that I am a perfectionist. You could say I’m a perfectionist in recovery, but yeah, I totally tend to want things to be lovely and pretty dang close to perfect. At times I’ve sacrificed the happiness of my family to obtain it. I’ve stretched myself way too thin in the name of making memories. You’d think that with Christmas, my lean towards perfection would be in overdrive. OPEN SEASON FOR PERFECTION! But actually, with Christmas, it’s been different. I quit striving. I just stopped. We haven’t baked a single cookie yet. I haven’t wrapped a single gift yet. The bins of Christmas decor are still in the middle of the living room. We got rid of tubs and tubs of decor that I’m just over. Because I’m over the extras. I’m just plain over it. I’m over trying to fit into a mold of what I thought Christmas was supposed to look like, because there isn’t one anyway. We only have one to compare it to, and besides – over 2000 Christmases later, they’ve all paled in comparison to that one and they always will. The first Christmas was the greatest mix of holy and human. There was straw, animal smell, and a star. There were hard hearts, new parents, and a tiny King. There were swaddling clothes, angels and sheep. There was afterbirth, glory and mess, and right there in a barn, it all mingled together. Christmas gives us an opportunity to scrap expectations. Kinda the opposite of what the Hallmark channel would have us believe, yeah? The way Christ entered our world was perfectly imperfect, full to bursting with love and joy, rough around the edges, and as un-fancy as possible in its appearance. What if we embraced those qualities — imperfection, love, joy, and simplicity — amid our to-do tasks and busy season? In this season, we have a choice to make. We can choose to chase perfection, or we can choose to chase holy. We set this box on our dining room table and we filled it with our Advent devotionals and chocolate calendars. We’ve been calling the dining room ‘the Advent room’ and eating our meals in here, reading through those books and laughing over the meal. I’ve been lighting the ‘good’ candles and listening to the favorite songs and enjoying my peppermint lattes without an ounce of guilt. We’ve stayed up late watching our most nostalgic holiday movies and I’ve done weekly talks with my friend Mary about the Hallmark movies we’ve seen premiere that week. My kids have visited Santa and worn shirts with Christmas trees on them and sung their hearts out in several Christmas programs. We put up just our favorite decorations and donated the rest. The kids love looking for their Shepherd each day to see where he is on his journey to the stable. We’ve read books with our kids about Hanukkah and Kwanzaa and Christmas, learning about our neighbors and friends. We’ll go to the baby shower our church is hosting for Mary of Nazareth (donations going to a local organization that is dedicated to reducing the prevalence of domestic and sexual violence and human trafficking) and my girls will don velvet dresses for the Christmas Eve service and we’ll open presents with the best of them. I think we’re going to bake two kinds of cookies. Maybe. Have fires on the hearth, and listen to the pair of owls who’ve moved into our backyard. What areas of perfection are you willing to drop? What do you think you’ll actually gain if things are less than perfect? It’s my prayer that, moment by moment, we will make room for the peace and full joy this season is meant to bring. I want my children to see me making room for Him in my inn, even amidst the to-do list. Whether at the beginning of the day before kids and life demand, or at the end of a long day before finally collapsing into bed – whenever you take a moment for yourself, I pray you allow the peace of the season to wash over you. This year, let’s drop perfect. 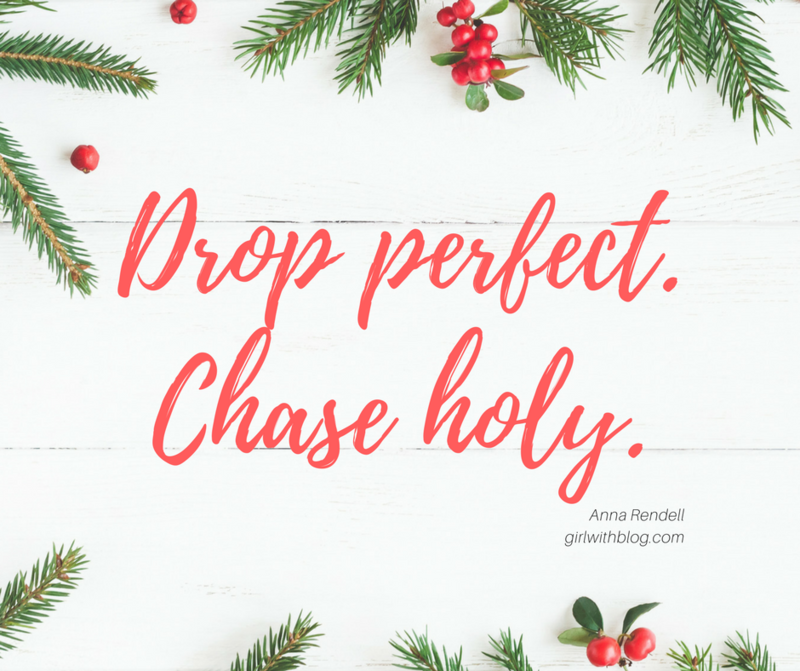 Let’s chase holy instead. A portion of this post is an adapted excerpt from A Moment of Christmas: Daily Devotions for Time-strapped Moms. Affiliate links used. You have OWLS?!! That is magic, my friend. I often awake at night hearing several outside and I love creeping to the open bathroom window to listen to their majestic calls. Each one has a different tone as they ‘who who-who who’ around in the trees, and it makes me feel like I’ve been awoken by God to listen to His glorious creation. We have done much of the same this year in keeping the decor that is meaningful and donating the rest. I love the simplicity and the memories captured among those baubles.